Carlisle Ford Nationals (June 3-5) is fun the entire family will enjoy the largest and most thrilling All-Ford event in the world. Ford, Mercury, Lincoln fans will have a showcase of over 2,200 vehicles to check out on the NPD showfield. During our 15th anniversary event, you will enjoy: indoor displays of concepts, customs and historically-significant cars and trucks; test drives by Ford Motor Company; a burnout competition; kids; activities; industry guests; a car giveaway; NHRA drag racing; autocross for all skill levels and club gatherings. The excitement continues with a shopping experience you won't soon forget, including an enormous swap meet, car corral and the Manufacturers Midway for the best in parts buying. 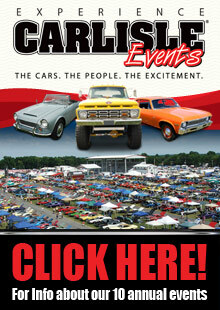 Thank you for reminding us about the Carlisle Ford Nationals in June. It's a big annual event I'm sure many look foreward to attending each year.